Tommy Taylor helped Valletta win the league in 1958-59, his first season with the Citizens. Taylor (second right) is seen in this photo lining up for a league match alongside (from left to right) J. Cilia, C. Mackay, M. Azzopardi, J. Darmanin and W. Bone. In November 1959, Valletta FC were sitting pretty at the top of the league standings. In those days, the Citizens had arguably the best team in their history. What they lacked perhaps was a top-class goalkeeper to bolster an already formidable defence. They had two fine goalkeepers in Zarb Cousin and Formosa but many argued that a team blessed with such talent needed a more flamboyant goalkeeper. The Lilywhites, therefore, kept their eyes open for a new man to guard their posts. The opportunity to strengthen their squad presented itself in 1959 when they signed international goalkeeper Tommy Taylor of the Republic of Ireland. Before coming to Malta, Taylor played for Irish First Division club Waterford FC as a part-time professional. During the 1957-58 close season, Taylor was in the Irish international party that toured Iceland. He also represented his country in October 1958 when he came on as a substitute during the second half of a friendly international against Poland. His displays for Waterford and his inclusion in the national squad brought him to the attention of the English clubs. West Ham, in particular, showed a lot of interest. West Ham even offered Waterford a four-figure fee for his signature but for some unknown reason, the deal fell through. Disappointed by this setback, Taylor turned his back on professional football and instead sought a steadier career with an Irish construction firm. As luck would have it, his firm earned a contract to complete major works in Malta in relation with the Harbour Development Scheme. Taylor was a very popular goalkeeper in Ireland. Apart from his obvious goalkeeping abilities he also had the unique distinction of winning the Irish Shield for his club by scoring the winning goal in a 3-2 victory. Helped by a strong wind, Taylor kicked a hefty goal-kick into the opponents' penalty area. The opposing goalkeeper tried to punch the ball away but it swerved past him and into his own net. 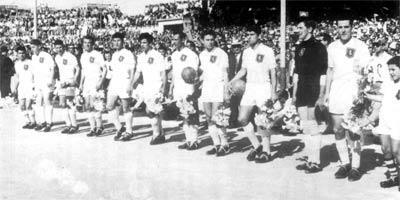 Taylor made his Valletta debut on January 10, 1959 against Hamrun Spartans in, of all roles, the centre-forward position. Valletta lost 0-2 but in his next game against Marsa he scored the Citizens' goal in a highly competitive 1-1 draw. Taylor played for the first time in goal for Valletta on February 2, 1959 in the 5-1 victory over Sliema Wanderers. He was an instant success and boosted the Whites' defence immeasurably. In six action-packed seasons he helped the Citizens win three league championships, two FA Trophies, the Cassar Cup and the Scicluna Cup. During his stay in Malta, Taylor was once picked to represent the MFA XI against visiting English club Manchester United. All good things, however, eventually come to an end. The Taylor legend concluded during the summer of 1964 when after playing against Zaragoza, of Spain, in the Cup Winners' Cup, he returned to Ireland. Taylor, however, was not forgotten by the City faithful and even now, more than 40 years since he left, he is still regarded as a benchmark for current goalkeepers in Maltese football.